Never do I appreciate a soft bed or warm room of my own than in winter. I wake up slowly and admire the light on my sheets, how my curtains add a soft diffuse to my plants and wall hangings. I lay and appreciate the few moments of quiet and solace before I step out onto the chaotic streets. And really, these mornings are the few moments where I don't feel so entirely busy. It seems the more I live in a place, the easier it is for my time to be filled up, until I am left with a couple of hours after work -- having to remind myself to schedule in a bit of time for myself. This past week my dearest friend and the closest thing I'll ever have to a sister came to visit, just for one day. In the most honest way, our time together is always so special and inspiring, and the more I am around her the more I recognize her as a muse and light in my life. So, we had our day, filled with eating and roaming the botanical gardens, and then more eating. And then the next morning, before her train to Vermont I made us pancakes. 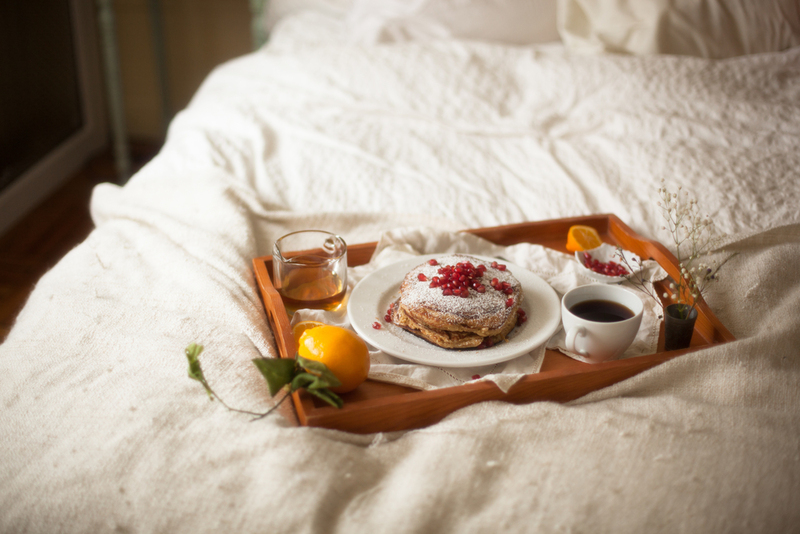 In this cold, snowy season, breakfast in bed is maybe one of the best ways to cozy it up. For yourself or loved ones, there is nothing quite like making food, or coffee, and then taking it back in bed with you before you start your day. And these pancakes are insane, as Melissa and I ate them, we remarked -- they taste a little like doughnuts?? Something about the citrus, ricotta, and whole wheat flour resemble the taste of lemon crullers, so, even better, right? II. In another mixing bowl, whisk together the ricotta, eggs, and vanilla until well combined. Then whisk in lemon juice, zest, and melted butter, and quickly add to dry mixture to prevent too much curdling (a bit is fine!) Whisk into dry mixture until just combined -- batter will be slightly lumpy. III. Ladle about 1/4 cup onto buttered, non stick skillet, over medium heat. Heat until bubbles form on the surface and then flip! Continue to do this until you are out of batter. IV. Serve dusted with powdered sugar, lemon zest, and/or pomegranate seeds!